Abstract: This document explains how to use a hobby wargame as a didactic tool. The game selected is Diplomacy; it permits to practice strategy design and implementation in fluid and competitive contexts. 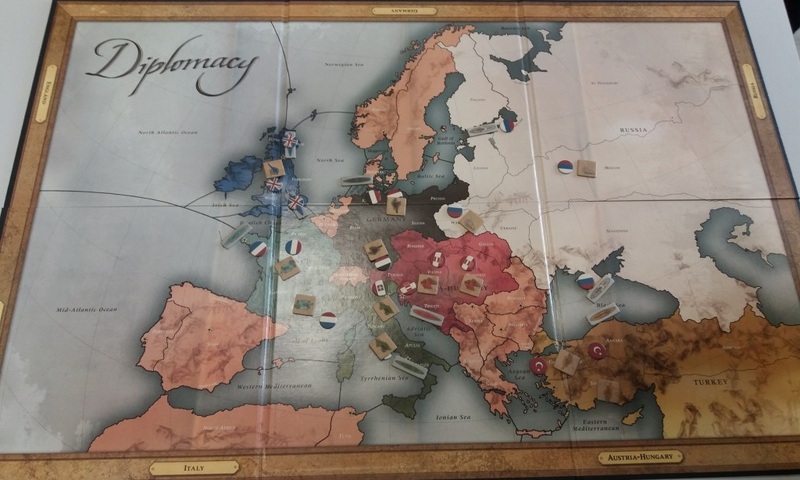 In order to do so it is recommended to apply the following steps: framework the wargame in IR theories and historical cases, ask the students to design a strategy for their country prior to the game, play the game and extract lessons linked to the contents of the course. Every year I organize a seminar on strategy design and implementation in competitive contexts as part of my course Defense Policy in the Degree of Political Science at the University of Granada. The star of the seminar is the wargame Diplomacy. I am not going to explain the game’s rules that can be found in this link. It is also possible to play it in this website. I am going only to suggest some practical tips to convert the wargame in a didactic tool. 1. Frame the wargame in IR theories and in case studies analyzed previously in the course. 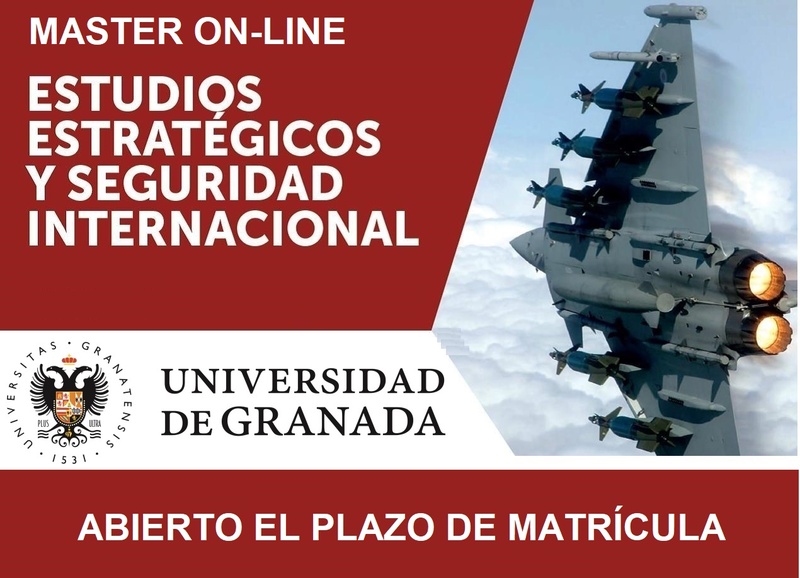 In the weeks before the wargame the students read and commented in class the chapters of the Handbook on Strategic Studies dedicated to Realist and Liberal theories of International Relations, Deterrence, Security Dilemma and Coercive Diplomacy. We have also commented in the classes this geopolitical analysis model. Furthermore, in a previous seminar the students tried to connect these theories and concepts with a comparative case study: the transition of power between Germany and the United Kingdom before World War I, and the current transition of power in Asia Pacific between China and the United States. Between others documents student read chosen chapters from Henry Kissinger’s Diplomacy and Graham Allison’s Destined for War. Can America and China Escape Thucydides’s Trap? In addition they read some articles like “The Donald Trump-Kaiser Wilhelm Parallels Are Getting Scary” by Stephen M. Walt. Finally students watch TV mini-serie 37 days, focused on the previous weeks to the outbreak of World War I. From these materials and from the IR theory students draw strategic lessons on the prolegomena of the Great War. They also identified parallelisms and differences between great powers interactions in that epoch and nowadays, specifically in the current US-China relations in Asia Pacific and its possible evolution in the decades ahead. With this theoretical and historical knowledge the students are prepared for the next phase: the strategy design. The students are distributed in seven teams, one for each country (Austria-Hungary, France, Germany, Italy, Ottoman Empire and United Kingdom) plus one control team. The students apply for its country preference via e-mail and the professor grants it in order of arrival. Negotiation capacity to create coalitions –lasting or temporal– that increase relative power. 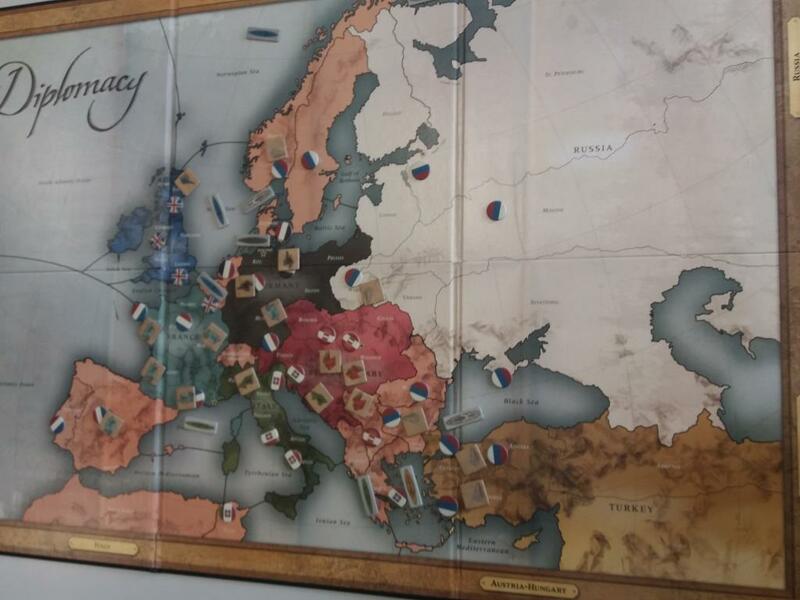 Diplomacy is different to the popular game Risk. In it dices are not used and forces generation depends on the control of supply centers. Success comes not from luck in dice rolling but from strategic vision and bargaining and persuasion abilities. Goals related to protection and expansion of its territory and sphere of influence. What coalitions it wants to establish through public or secret negotiations, usually in a bilateral basis. Coalition formation entails the risk of being betrayed: the alleged ally can be negotiating at the same time with a third part against our interests. Each team elaborates its strategy the week before the game-playing. 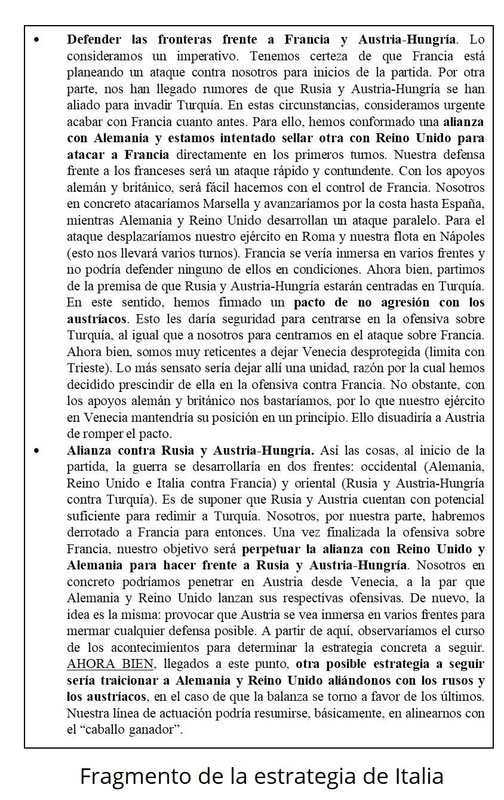 That same week interactions between countries start so some alliances are included in the strategies. Each team sends the strategy to the professor before the game-playing begins. We dedicate two sessions (4 hours) to play Diplomacy. Control team role is crucial for keeping a good rhythm. Calculating the orders and movements of the different players can be cumbersome. Two members of the control team write orders in the class board and the two others apply them in the game’s board. According to Diplomacy’s rules all players should dedicate half an hour to the first negotiation round and 15 minutes to the following ones. Having started negotiations the week before, the first round and order’s writing last only 10 minutes. In this way more time is available for playing the game. The dynamic of the game is fluid, as well as the bargains and alliances. The ambiguity over the fulfillment of pacts increases uncertainty. This obliges to an adaptive strategy. Each team must to react strategically to changes in the map and in the structure of alliances. Territorial gains and losses are conditioned by balance of power and the architecture of pacts. It is not a military tactical wargame but a strategic-political one, which is the level studied in the course. At the same time, given the lots of orders bargained and decided in a limited amount of time, mistakes occur. This remembers the friction in military operations, which logically entails strategic costs. End state of the wargame. In this course the team representing Russia won. At the end of the second session (4 hours in total) wins the team with more supply centers. In this occasion it was Russia with 9 of them. Turkey on the opposite was erased from the map as an independent political entity. Russian’s success is explained by a right alliance policy with the European Central powers (Germany and Austro-Hungary) which let Moscow to implement a sequential expansion: first in the south against Turkey and afterwards in the north against the Nordic countries. The seminar does not finish with the wargame. The next one is perhaps the more important step: debriefing. We dedicate one session to analyze the design and implementation of every team. Goals and strategic guidelines. Until that moment were only known by the team and the professor. Which difficulties arisen during the implementation and how were they managed. What other strategic options may have been better. How geography constrained strategy? Challenges and opportunities presented by the geographic position of its country. Each presentation is followed by a Q&A. It is important that the briefings may not be a narrative about the events but an analysis of strategic competence. It is convenient also that the professor point out what is being analyzed with the theoretical contents of the course. The wargame offers opportunities to talk about balance of power, balance of the threat, consequences of the vacuum of power, the importance of keeping strategic initiative, the role of reputation in alliance formation and strategies like bandwagoning or buck-passing. As part of a seminar, the Diplomacy is useful as a didactic tool. Students engage with the wargame and learn in first person the complexities of designing and implementing strategy in competitive contexts. The game is an incentive to combine strategic vision with flexibility in alliance formation. And it is a good opportunity to connect IR theories with simulated basic practice. Javier Jordán is Associate Professor of Political Science at the University of Granada, Spain.